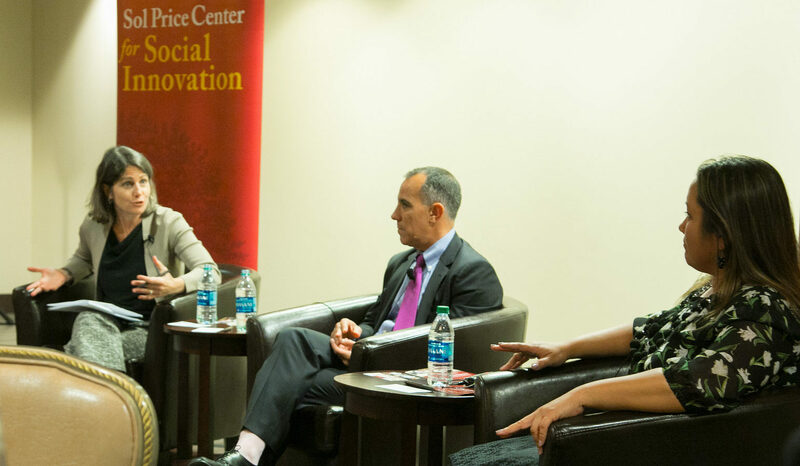 The USC Price Center for Social Innovation opened its Pathways to Opportunity series for the 2018-2019 academic year on Sept. 20 with a discussion on social innovation and charter schools, exploring new educational ideas coming out of charter schools and how they can be applied to schools more broadly. 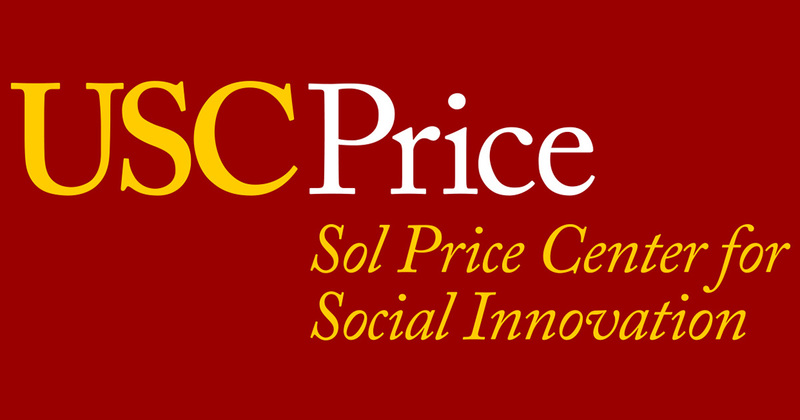 USC Price Dean Jack H. Knott said that he was pleased that the Price Center decided to kick off its series of events for the year with this topic. 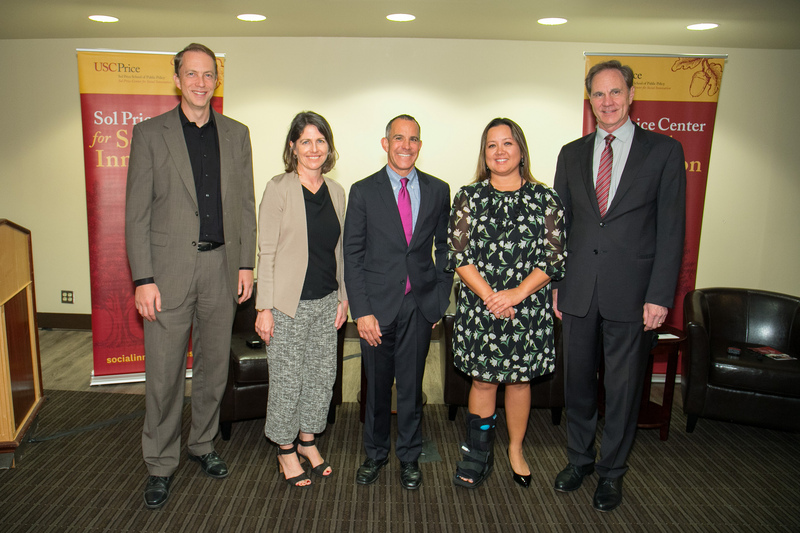 Participating in her first event since joining the USC faculty and Price Center this year, visiting professor Christine M. Beckman moderated the discussion. She framed the conversation by noting that charter schools are themselves a social innovation, as they provide a new model for governing and thinking about accountability within public education. The first charter schools were established in California in 1992 to provide more local autonomy in schools with the hope to increase learning opportunities for all students, particularly academically low-performing students, experiment with innovative ways of teaching, and move from a rule-based to a performance-based accountability metric. Roughly one quarter of all public school kids in L.A. are in a charter school, more than any district in the nation. “The conversation I want to have today is about charter schools as an organizational form that was created in an effort to innovate and improve public schools – an experiment in public education – and to think about the ways that objective has been met, where it’s fallen short, and where we go from here in terms of the larger goal of access and opportunity for all students,” Beckman said. Joining Beckman were two local leaders who manage nonprofit networks of charter public schools – Green Dot Public Schools of California president and CEO Cristina de Jesus and Alliance College-Ready Public Schools CEO Dan Katzir. Together, they oversee 50 middle and high schools serving nearly 25,000 students. Green Dot began 19 years ago with a model of starting high schools from scratch. It eventually expanded into middle schools, realizing the difficulty of taking in 9th graders who were ill prepared for the academic rigors of high school, and turnarounds, which is taking over struggling schools formerly run by the district. The challenge of that first turnaround, Locke High School in South Los Angeles, a decade ago had a profound impact on Green Dot. Alliance runs a highly decentralized network of schools, allowing budget and instructional decisions to be made in collaboration with staff at the local school site, while also providing essential resources at the network level. Each school has a parent engagement specialist whose job it is to forge a relationship with parents. These parent liaisons organize workshops, put parents in touch with community organizations, and on a day-to-day basis, make sure parents know if a child is absent, not doing homework or at risk of not passing a class. Every five years, charter schools need to prove their effectiveness to renew their “charter” (or contract) with the district in order to continue serving children, and both de Jesus and Katzir believe that all public schools should have the same accountability. “If you can’t show high levels of attainment or strong growth within a five-year period, you have lost five years with those kids and will never get them back,” Katzir said. Most charter schools in California tend to be made up of 90 percent or more students who qualify for free or reduced lunch. One innovation being explored by some charter organizations is a mixed model that brings students from middle- and high-income families back into the public school system to make up half of the school’s population with low-income students comprising the other half. Katzir noted the stark disparity between college graduation rates among different student populations. The chance of a low-income student completing a four-year college degree is 9 percent compared to 77 percent for white, middle- or upper-income families. “It’s unbelievably embarrassing and something that really isn’t talked about in terms of where our country is right now in terms of readying our next generation to tackle civic leadership and to participate successfully in a global economy,” Katzir said. There has always been a healthy level of competition among charter schools, but in the past three years de Jesus and Katzir have seen a growing sense of unity and collaboration in the charter space. While charter operators have improved the openness and sharing with each other, Katzir attested that charters have fallen short in collaboration with local districts. De Jesus contended that it was time for charters to look at their successes and give back into the system.